Born in Watkinsville, Georgia, Laura Haygood moved to Atlanta at age seven, received her early education from her mother, enrolled at Wesleyan Female College, Macon, Georgia at age sixteen, and graduated in two years (1864). She established a private school for girls in 1966. In 1872, she was appointed teacher, and later principal, at Girls’ High School, the first Atlanta public school for girls. During these years, her roots were deeply entrenched in Trinity Methodist Church in Atlanta. She pioneered there in the organization of the Trinity Home Mission, a church home and industrial school to serve the poor and needy that later became a model for city mission projects. 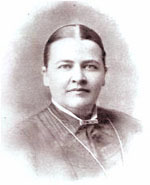 In 1883, she assisted in organizing the women’s home mission work of the Methodist Episcopal Church, South. In her writings and speeches, she addressed issues of women’s rights and the needs of the poor. In 1884, she decided to go to China. The McTyeire Home and School in Shanghai, completed and dedicated seven years after her arrival, remains today a visible symbol of her work. The Laura Haygood Normal School, built in 1916 in Soochow, China, also honors her work. She died in Shanghai, and was buried there.